When a class like this comes along, you cherish the moments and count the blessings. Only one Florida player had more than eight points. KeVaughn Allen had 35. They literally fought to the final second. Absolutely no quit in this group all season long. Florida taking the podium (Chiozza, Allen, and Coach White). White: What a wonderful college basketball game to be a part of. First version of #Badgers falling at buzzer in OT filed. Interviews now. 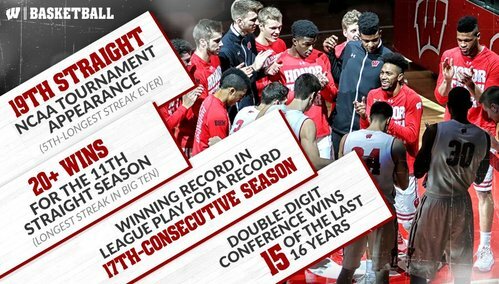 It's what makes us proud to be #Badgers . 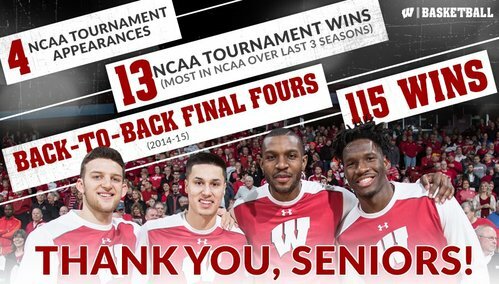 Thank YOU Badger fans, for a great season! Chiozza on Showy's shot: It takes the life out of you a little bit. FINAL SCORING: Nigel Hayes 22, Ethan Happ 21, Zak Showalter 14, Bronson Koenig 13, Vitto Brown 10, Khalil Iverson 3. Wisconsin coming up. Gard, Koenig, Happ, and Hayes. Greg Gard, Ethan Happ, Bronson Koenig and Nigel Hayes will address the media shortly. Greg Gard: Obviously a very gut-wrenching game. The last 45 minutes are going to sting and hurt for quite awhile. Greg Gard: This program is in good hands as the four seniors exit. Greg Gard: "I can't thank those four seniors enough for what they've done for this program and this University." Bronson Koenig on game's final shot: He's extremely quick. We knew that coming in. One of the quicker guys we've seen all year.